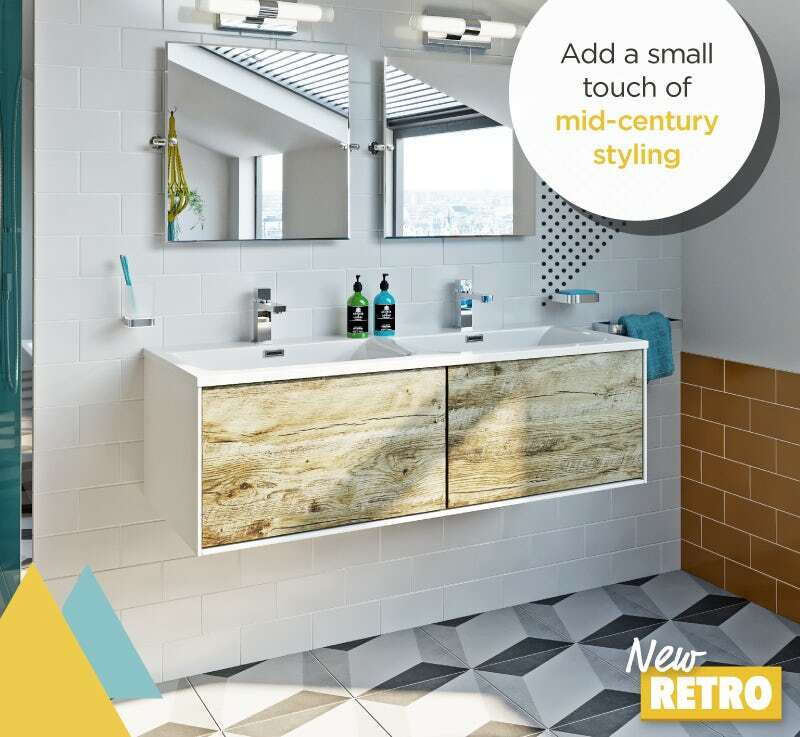 In part 2 of our “Get the look” style guide, we’ll be looking at some of the products you can use to create your New Retro bathroom. If you haven’t already done so, read part 1 to find out what the look is all about by clicking on the banner below. 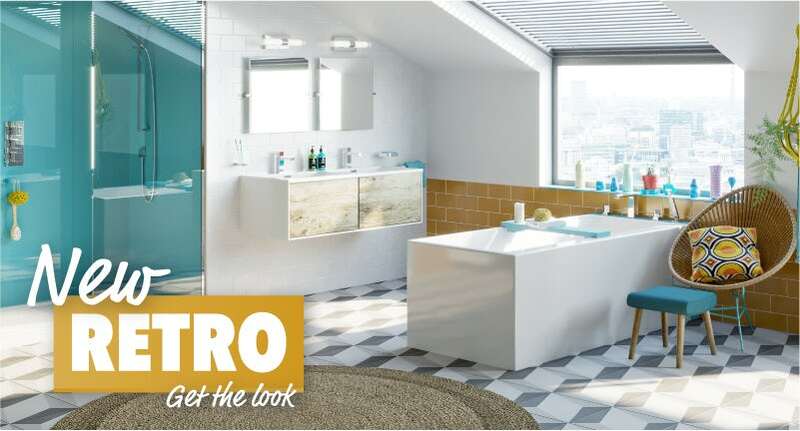 In part 1, we gained a good understanding of what the look is, why retro bathrooms are so popular and discovered a range of inspirational sources for your design. In this blog post, we’re going to delve deeper into the specifics, demonstrating which types of bathroom products lend themselves to this look, and why. Now, let’s take a look at the different elements that combine to create this gorgeous bathroom design. 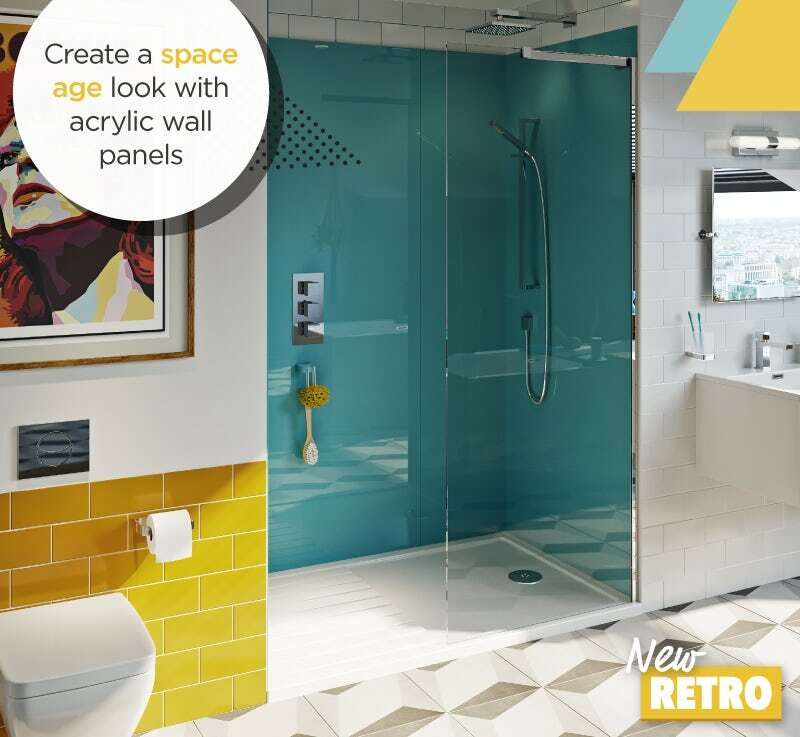 Forming a focal point for the whole room, the recess shower enclosure has been covered with acrylic wall panels in a bright and cheerful shade of blue. Acrylic wall panels are a great choice for this look, as this modern material really captures that space-age retro age of experimentation with new and exciting textures. The low profile shower tray provides easy step-free access, whilst the frameless screen helps to keep things feeling light and airy. The dual outlet shower comes with square-shaped controls and square-shaped heads. Have you noticed a theme developing? As we touched upon in part 1 of this style guide, geometric shapes are very important to achieving a retro look and feel. And when it comes to your bath, there's no exception! In our bathroom roomset, I've opted for a simple, straight bath, but used in a semi-freestanding setting. With gloss white panels all the way around, the clean lines and straight edges of this bath create a look that really captures the feel of a bathroom from the 60s or 70s. To accessorise the bath, I've chosen a bath bridge painted in the same bold colour as the shower enclosure area. Perfect for keeping things close to hand; soaps, lotions, your tablet or even a cheeky glass of wine! If you're sharing your bathroom space, there's nothing better than a double basin. You and your partner can both enjoy a spot in your bathroom that is solely yours. To achieve this look, whilst sharing your basin space, I've opted for a simple, rectangular vanity unit. The gloss white finish complements the bath, keeping things bright and reflective, whilst the rustic oak drawer fronts help to add a small touch of mid-century styling in the form of a warm wood finish. The handless drawers provide a sleek element, whilst the wall hung design allows the gorgeous feature floor to be admired and appreciated uninterrupted. At the risk of sounding like a stuck record (and that would be very retro indeed! ), geometric shapes are the key to unlocking the New Retro look. To complement both the bath and basins, I've opted for a quite contemporary set of taps. 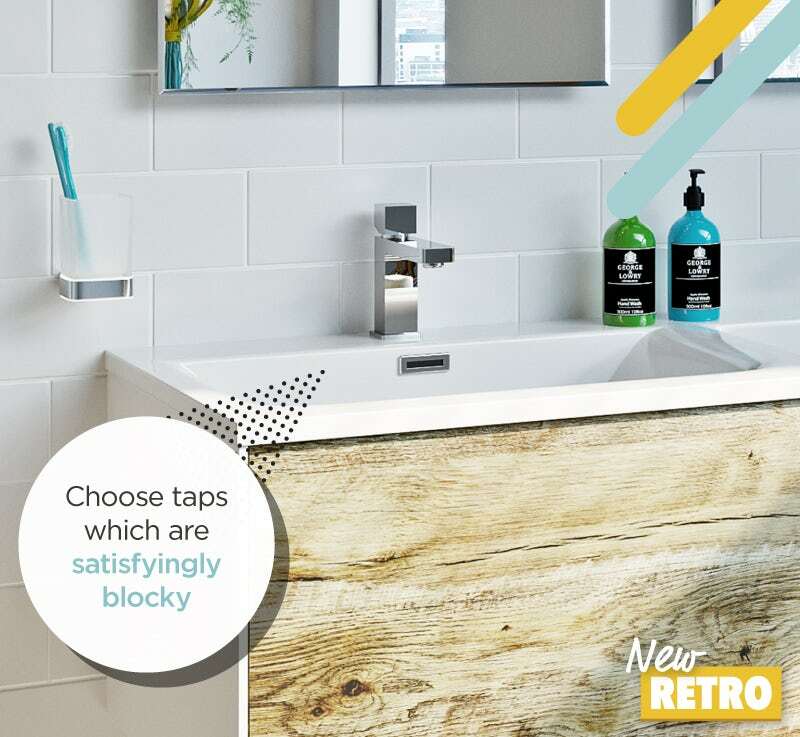 Instead of a cylindrical body, these taps are square-shaped with a satisfyingly blocky look to them. For the bath, I've gone one step further and chosen a 4 tap hole bath shower mixer. Of course, with an acrylic bath, you can simply drill however many tap holes you need, so this provides a nice, uncluttered look with the shower hose concealed beneath the bath when not in use. As you may have already guessed, to complement our New Retro bathroom, I've gone for a square-shaped toilet. However, the wall hung design is a major consideration as it does a very important job. It keeps the view of your funky feature floor tiles uninterrupted, so you can fully admire them from any angle. If a wall hung toilet isn't practical for your bathroom, you could always choose a square close coupled toilet or even a back to wall toilet, with a gloss white back to wall unit. If you haven’t already done so, check out part 1 of this style guide, where we introduce the look and discover the influences behind it. If you like what you’ve seen, read on! 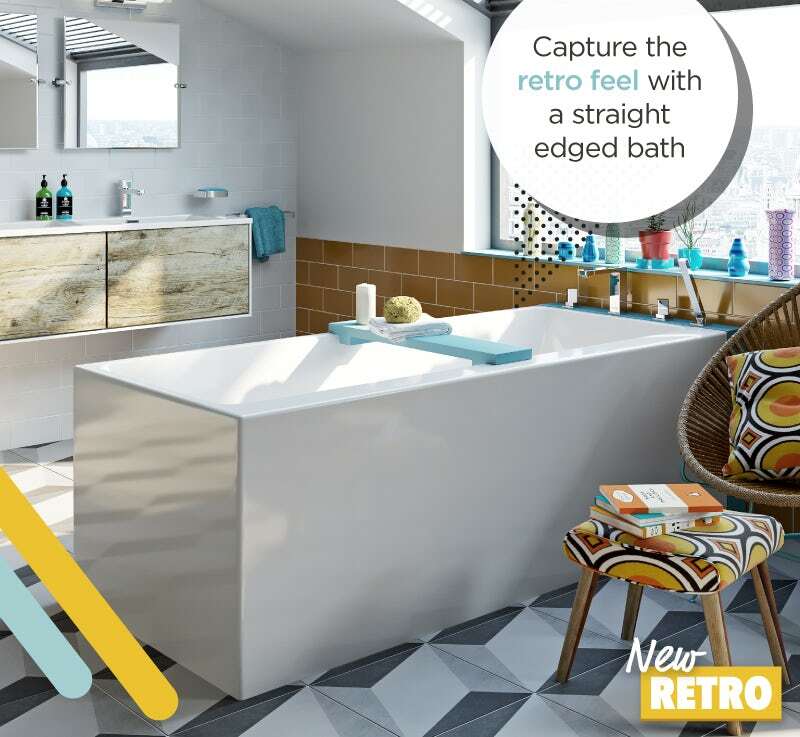 In part 3, we’re taking a look at the types of colours, patterns, textures and tiles you can use to accessorise your New Retro bathroom. Click on the banner below to continue reading. 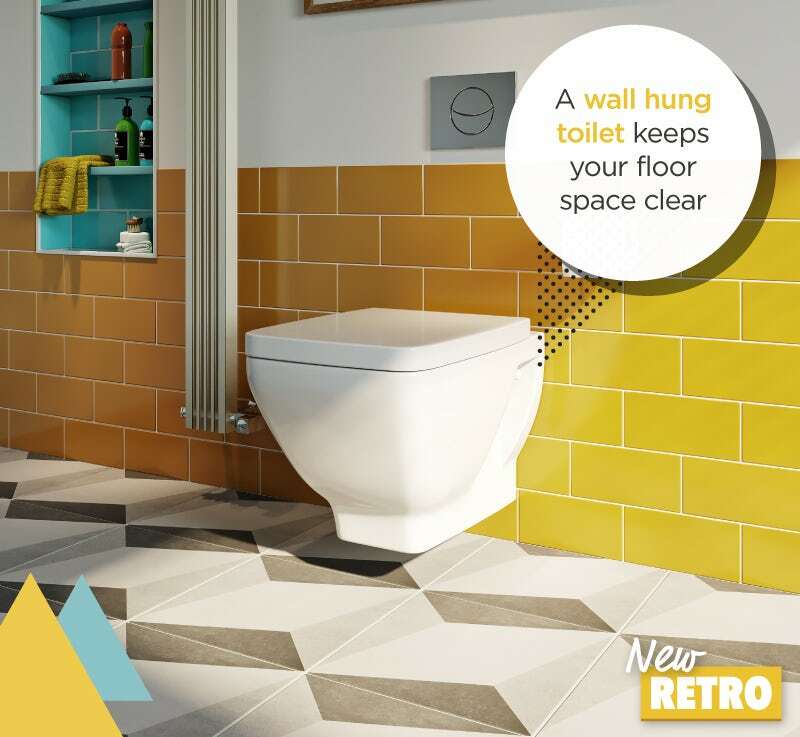 In part 3 of our "Get the look" style guide, we’ll be looking at some neat ways to accessorise your New Retro bathroom, by combining different colours, tiles, textures and accessories. Sometimes, it’s good to tamper with the classics. Check out our latest get the look style guide, where you’ll discover a new and eclectic way to create a retro masterpiece. 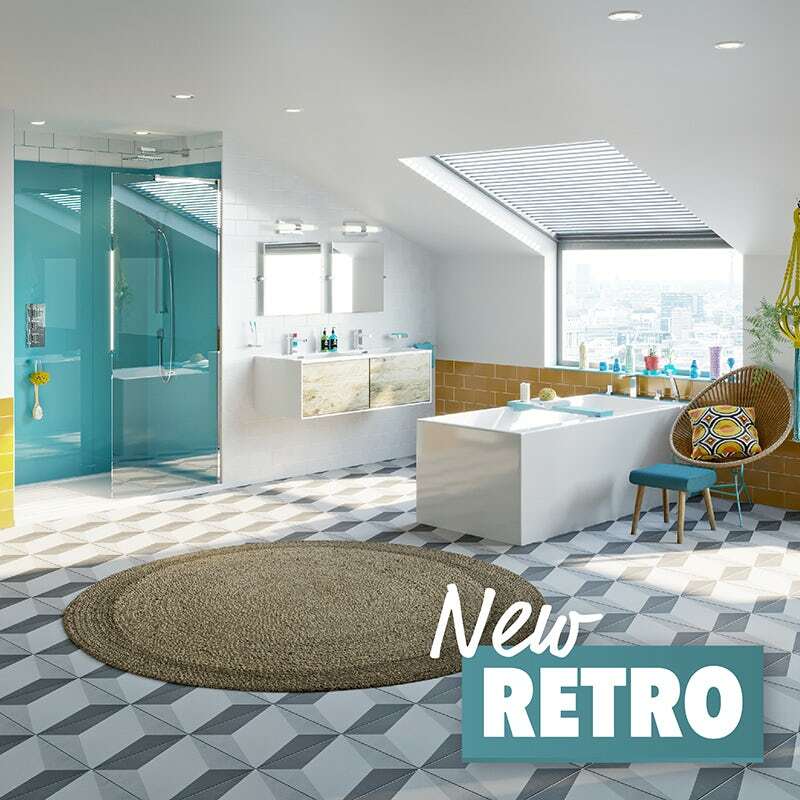 In the fourth and final part of our "Get the look" style guide, we'll be showing you exactly which products we used to achieve our New Retro bathroom and why.